In Santa Cruz, CA the Wavestorm World Championship (formerly known as the Kirkland Classic) is held every year. It’s a foam surfboard only surf contest that crowns a champion based on how much of a kook the surfer can be. From dropping in on each other, to slamming into each other, to purposely throwing your foam board into other surfers, its more of a demolition derby than a surf contest. And you know what else? It’s the most fun a lot of these guys have all year. Foam Boards are without a doubt the black sheep of the surfing world.The amount of fun they provide is often simultaneously the single greatest complaint and criticism about them. Take a minute to let that sink in. Foam boards were designed on Duke Kamehameha’s philosophy that “the best surfer out there is the one having the most fun.” Soft Tops (or Foam Boards) have served as an on ramp for so many surfers of all ages, sizes, and disabilities to stand up and actually experience the joy of surfing their first wave and believe it or not, have helped the surfing community reconnect with the simplicity of just having fun! There’s plenty of reasons to add a soft top to your quiver, and we’re here to walk you through the best foam surfboards out there! Custom Fingerprint-Textured IXPE Foam removes any need for Surf Wax! 8 Final Thoughts - Which Should You Get? South Bay Board Co. have really brought their best work to the Verve series. By far the most impressive feature is their IXPE (Irradiated Cross-linked Polyethylene) Fingerprint textured foam that allows for a completely wax free surfing experience! Aside from never having to deal with cleaning off and re-applying wax, the deck is nowhere near as rough on your skin. A win - win overall. The Verve is 8’ x 23” x 3” and 15 lbs. The board can support surfers up to about 230 lbs which is a little low for an 8 ft board. 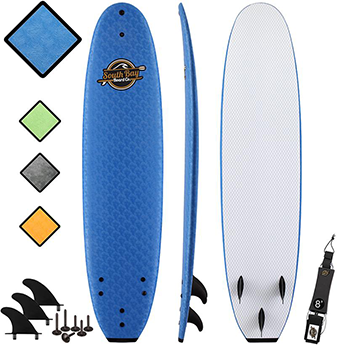 The board is supported by 2 full length wooden stringers and a 2/3 fiberglass center rod stringer as well as a diamond weave slick HDPE bottom deck for extra stability, rigidity, and durability. The Verve’s core is made of heat compressed Close Cell EPS. If you’re unfamiliar with Closed Cell technology, it’s designed to completely prevent any water absorption. Some foam boards absorb water over time, and as a result, become heavier and ride a lot less efficiently. You won’t have to worry about that with the Verve. There’s also a heat release valve built into the board. Excess heat buildup leads to delimitation and bubbling of the deck so being able to release this heat periodically will extent the life of your board considerably! SBBC refers to the Verve as a professionally upgraded Wavestorm and they have a lot to back up the claim. 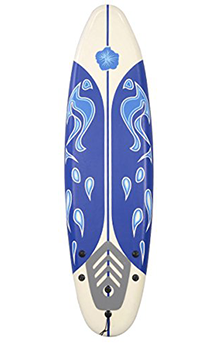 Shaped like a mini-log / torpedo with a tri-fin set up, the tampered rails, entry level rocker and rounded nose and tail do provide a much more maneuverable wave riding experience than their competitor. The board also includes a mount for a go pro at the top of the deck, fins, and a leash to get you started. There’s an option for the “full package upgrade” that we would recommend which includes a board bag, traction pad and surfboard paint pens. For just a few extra bucks it’s a steal. The Verve is the best foam board for beginners to learn on, as it will give them a leg up compared to learning on most other foam boards out there. Weight bearing capacity is on the lower end and the package upgrade is kind of empty. The Wavestorm is THE original and classic soft top foam board! When you hear someone taking about a Costco foam surfboard, this is what they’re talking about! These things have been seen in just about every condition you can think of. From paddling in at Jaws​ to knee high summer beaches around the globe, the Wavestorm’s reputation precedes itself. At 8' x 22 1/2” x 3 1/4” and 11.5 lbs the Wavestorm is a great size overall for beginners and intermediates alike and the Rasta Burst color pattern will help you spot this board all the way down the beach! Soft Foam Construction, a strong EPS core with a 3 stringer system and a soft water, barrier skin crosslink top deck and rails all provide a stable, flexible and comfortable soft top experience that’s hard to beat! A High Density Polyethylene (HDPE) slick bottom skin provides the Wavestorm with added durability. A traction pad, removable rubber fins, and a leash are all included so that when you’re ready to go, you’ll have everything you need to paddle out. Also worth mentioning, the leash is kinda cheap. It’ll do the trick but it’s prone to tangle and that gets kind of obnoxious after a while. The downside to the Wavestorm is that for everything that makes it so reliable and easy to catch waves with, the ability to really ride waves has always been slightly limited, especially in regards to turning the board. The lightweight helps, but you’ll have to be in just the right spot to make even the most basic maneuvers. Limited Maneuverability and a cheap leash. The California Board Company (CBC) 9’ could easily be mistaken for an actual longboard if you saw it from a distance. The wood deck graphic design actually came out incredibly sharp and seriously clean! At 9' x 24" x 4” weighing 16 lbs, the CBC 9’ has some weight to it. As a result, it can hold surfers up to 275 lbs. making it a good choice for any heavier riders looking to catch some waves. CBC goes heavy on heat laminated construction. The multi layered 3 stringers are all heat laminated. The HDPE slick bottom and 100% Waterproof EPS core are both heat laminated. Even the neat wood deck graphic is heat laminated into the IXPE foam top! In short you’ve got a virtually indestructible board. However, this actually backfires out in the water. The board is so rigid it makes the actual experience of riding waves like riding a bucking horse. Any chop will have you trying to hold on for dear life and maneuverability is almost non existent. On top of that, the fins provided are all the same size and have little to no give whatsoever. A leash is also provided and is actually a pretty high quality which is a plus because you’re probably gonna need it. Too Rigid for it’s own good, creating a stiff wave riding experience. The Ruccus is an awesome fun shaped foam board from South Bay Board Company! SBCC has applied all of the same winning features to the Ruccus as the Verve, including the IXPE Fingerprint Wax-less Deck, HDPE Slick Double Concave Bottom, Go Pro Mount, tapered rails and excess heat-release valve. The Ruccus key difference is its shape and size. At 7’ x 22" x 2.85" and 10 lbs the Ruccus isn’t built for bigger surfers. Maxing out at a weight bearing capacity of 200lbs, the Ruccus is shaped for younger and lighter surfers. With more of a shortboard / fun board wave riding experience in mind, the Ruccus is designed with a squash tail and more narrow, pointed nose that allow for way, way more maneuverability than other SBCC boards and traditional foam boards. The Ruccus is a little more difficult to learn on than traditional foam boards. The price paid for superior maneuverability and a more complex wave riding experience is a more difficult learning curve. It’s worth it, but it should be kept in mind if you’re just looking for a simple wave riding experience, this board might not be the best choice for you. Fins and a leash are included, as well as the same option for a package upgrade that feels a little less unnecessary, and this is due to the traction pad actually serving a purpose on the Ruccus. While you don’t really need a traction pad thanks to the fingerprint deck, you might want to throw one on there to play around with some more complex maneuvers and sharper turns with this board. At this point, having a day bag and some paint pens thrown in with the purchase of the kick-pad is a decent perk. I’m gonna be blunt about this. This board is solely for children ages 6 and under. Giantex have created an aesthetically pleasing deck design but after that this board misses the mark for being a foam board in every way. 6’ X 20'' X 3” and a weight of roughly 5 lbs. Giantex have essentially constructed a giant boogie board and are passing it off as a foam board for kids. Claims of being able to support up to 200 lbs are completely unfounded. Most surfers weighing half of that will have problems keeping this board from sinking. The quality of the EPS core and polypropylene (PP) bottom are also questionable as the board has been known to absorb water and lose its structural integrity very, very quickly. A leash and fins are included, completing the look of a foam board but nothing more than that. Ultimately, if you’re looking to introduce your children to the idea of surfing at the youngest age possible while keeping them safe from injury, this board is a good bet. Next to that, if you want them to actually catch and ride waves, look somewhere else. It’s more of a giant boogie board than a surfboard. Don’t expect much! 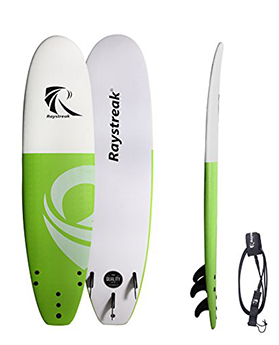 The Raystreak 7’2” is another great go-to foam board for beginners. 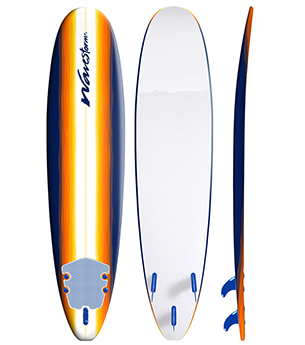 7’2” x 22.8" x 3.2 and roughly 18 lbs, it’s one of the heavier boards on the list. This provides an abundance of stability at the cost of maneuverability. The Raystreak can support surfers weighing up to 220 lbs. Constructed with double reinforced epoxy sealed stringers, a 6 ounce fiberglassed internal core, and 100% waterproof EPS foam, Raystreak goes toe to toe with its competitors in terms of durability. Raystreak uses a combination of hot-pressed Irradiated Cross-linked Polyethylene (IXPE) and Crocskin to create a non-slip and non-abrasive deck that almost compares to its competitor SBCC’s custom Fingerprint Texture. You’ll get away without using any wax with the Raystreak, but there will be times you wish you had added at least a thin coat. Overall, it’s an impressive deck but it’s just shy of providing the same quality of wax-less surfing as its competitor. Raystreak stays with what works and uses a high density polyethylene slick bottom to help improve speed on such a heavy board while also establishing ultra durability. 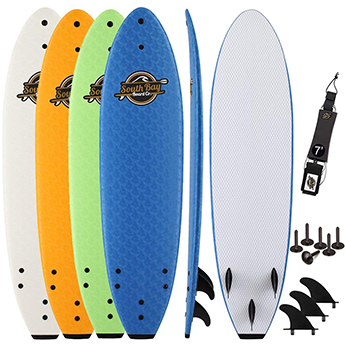 A tri-fin set up with fins and a leash included as well as a simple but recognizable deck design that comes in 4 different color schemes leads to an overall enjoyable and reliable foam board. #7 Wave Bandit Catch Surf EZ Rider 7’0"
Wave Bandit’s EZ Rider embraces everything about the foam board scene - the good, the bad, and the Kooky - and gives the scene a simple, fun, 80’s looking board. With an extremely loud Neon Pink and Blue deck design you’ll hear this thing in the water or on the sand whether you want to or not. Other designs equally as loud (Neon Green / Neon Blue) and quite decks (White / Yellow Bottom) are available as well. Double Maple Wood Stringers help provide added rigidity and ensures the EZ Rider will retain its structural integrity for as long as possible. An EPS core and HDPE slick bottom also keep things stable and durable. A tri fin set-up with included removable plug-thru fins will have you mostly ready to paddle out. It’s worth noting the EZ Rider does NOT include a leash, and I’d definitely recommend one for any beginners. Spending half your session paddling in to get your board only to have to paddle back out again is an awesome way to burn your energy and miss waves. Empire’s Ehukai Soft Top is pretty much a “what you see is what you get” foam to surfboard. 7’ x 22.0” x 3.125” and 13 lbs. this board can support riders up to 215 lbs. A relatively plain deck design with an oddly placed picture of a wave makes it look like the board still has some packaging wrap stuck to it. The Ehukai is constructed of four stringers and a high density 100% Waterproof EPS core that prevents any premature wear or breakdown in rigidity. Unfortunately, even with all that foam the deck is still susceptible to dents. Maybe it’s a quality issue, as the board doesn’t feel any less rigid than its competitors, but after a couple sessions, the low quality of foam will start to show in a couple of small random dents. A tri - fin set up and a mini-log shape will give you some more wiggle room in terms of performance and maneuverability. Fins and a Leash are included so you won’t have to make any surf shop pit stops on your way to the beach. Overall, the only real flaws to this board are a weaker than average deck and a slightly uninspired creative deck. The other silent flaw is that there isn’t really anything to help Empire’s Ehukai standout. It’s like the cumulative average of the foam board industry, and as a result it’s pretty easy to pass this up for a lot of other boards out there. This board would make a great gift for someone with a detached interest in wanting to learn how to surf as it would serve as a perfect entry board into the sport. 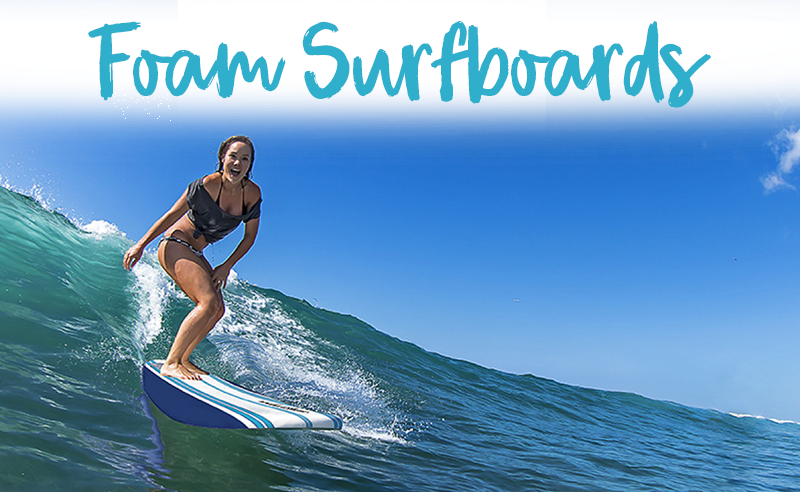 California Board Company makes it onto our list again with the only true shortboard foam board of the list. 6’2 x 22 x 3 inches and 7.5 lbs, the CBC Fish is going to be for surfers solely looking to learn how to shortboard on a more durable board, or for experienced surfers looking to have some fun experimenting with a foam board. The board’s weight limit is also 175 lbs. A drastically low amount compared to the rest of the larger boards on this list that needs to be considered when purchasing your board. CBC stays with their preferred construction and uses heat laminated everything. 3 heat laminated multi layered stringers, a heat laminated IXPE deck (with another clean graphic! ), heat laminated HDPE slick bottom, and a heat laminated 100% Waterproof EPS Core all create yet another virtually indestructible board. The CBC Fish suffers from some of the same rigidity issues as the 9’ mentioned earlier on our list, but the shape of this board and it’s smaller size actually permits a lot more in terms of maneuverability and being able to actually get away with putting so much focus into making the board so rigid. 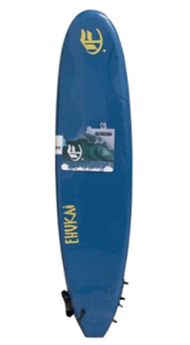 With a fish tail and a tri-fin system, this board is able to perform on a higher level but not without some resistance. A leash and fins are included making for an easy entry into the water. In short, California Board Company have produced an interesting foam board to play around with for the inquisitive and experimental surfer. A 9’ x 24.5” x 3” log weighing 17 pounds isn’t exactly going to live up to its name of being a Liquid Shredder. It’s more of a cruiser but a cruiser with a lot of speed! The Liquid Shredder opts out of using an HDPE slick bottom and sticks with simple polypropylene. As a result it’s not as rigid as a handful of its competitors but it also only suffers a minimal amount and the two wooden stringers and one fiberglass center stringer also help rebalance for the materials used. Expanded Polyethylene (EPE) is the choice of foam used for the deck. This foam is actually very comfortable, but its anti-slip properties lack compared to other technology so make sure you grab a bar of wax. The Liquid Shredder is fast! Like really, surprisingly fast for a foam board. It paddles with ease and glides effortlessly across the face. This is in part to the PP bottom, but also due to the more narrow and torpedo like shape of the board. 3 fins are included for this tri-fin set up but a leash is not, so plan on purchasing one separately if you don’t want to chase your board in and out of the lineup all day! Casual, fun, easy experience or lifelong student driven to perform at your best level? This is essentially what the debate of foam vs fiberglass boils down to. Foam boards are a ton of fun! They’re stable, they paddle fast through the whitewater, and they make catching waves and standing up incredibly easy. Their sole focus is to enable as many people as possible to experience the joy of simply riding waves. Fiberglass boards on the other hand, are a reflection of what it means to constantly be pushing your surfing to new limits. Even the process of making fiberglass boards is constantly undergoing different tweaks in size, shape, materials, and techniques. A fiberglass board is much more susceptible to breaking in a way the requires replacing your board entirely. They are significantly lighter, faster, and able to outperform foam boards by miles. The fiberglass board is the tool of one looking to push themselves and their skill as a surfer every time they paddle out. ​Foam Board Designs are mostly centered around longboard or mini-log shapes, but there are exceptions. Longboard Design - A board at least 8’ long with a round nose and a rounded or squash (flat) tail with a relatively wide deck and rounded rails are par the course for the majority of foam boards. Mini - Log / Torpedo - Mini-Logs / Torpedo shapes are essentially the same as a longboard, but they are shorter (7’ - 8’ max) and often have a deck that’s more narrow. These boards sacrifice a small amount of stability and speed for an increase in maneuverability. Fish Shape - Foam Boards with a fish shape are shaped like a shortboard (6’2 - 6’6”) and will be much more difficult to stand up on. The hit to stability is more than. 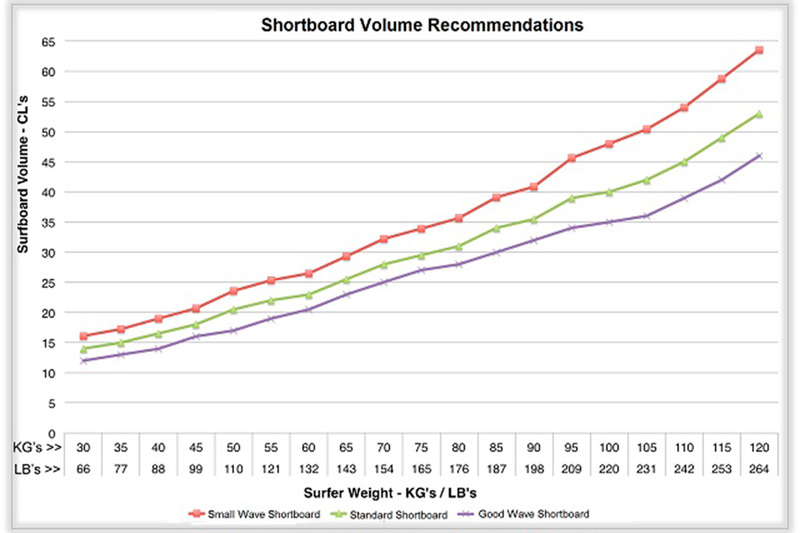 Volume will determine how buoyant your board will be in relation to your weight on the board. The higher your board floats you out of the water, the less resistance you’ll encounter and thus the more speed you’ll have when you’re paddling. The faster you can paddle, the more waves you’ll be able to catch. You can calculate the volume you’ll need with this chart. Durability is referring to how much of a beating the board can take without being effected. Most foam boards are extremely durable thanks to improvements in board construction and increasing quality of the materials used in constructing foam boards. The true struggle of the foam board is not sacrificing performance entirely for an indestructible board. ​Length and Width are usually on the larger side when it comes to foam boards. The idea of a foam board is to make catching waves as easy as possible for surfers of any skill level and longer, wider boards are a much better choice for that than shorter and narrower boards. IXPE (Irradiated Cross-Linked Polyethylene) - Irradiated cross-linked polyethylene foam (IXPE foam) is very fine celled microcellular foam. The surface is more smooth and flat and it outperforms other foams in regards to thermal insulation, being waterproof, and shock absorption. EPE - Expanded polyethylene foam, is a molded semi-rigid, non-crosslinked & closed-cell type of polyethylene foam that is non-abrasive, flexible, strong and lightweight. HDPE (High Density Polyethylene) - High Density Polyethylene has become the industry standard for the bottom of most foam boards. Aside from being extremely strong, impact resistant, weather resistant and light weight, HDPE is also recyclable. Soft tops are notoriously difficult to recycle so this is a step in the right direction. PP (Polypropylene) - Polypropylene is a strong, durable, and lightweight plastic. Unfortunately it’s not as easy to recycle as HDPE. The advantages of a foam board are simple. They’re fun, virtually indestructible, and they make catching waves as easy as possible thanks to an abundance of stability. The Ford of the foam board world! Wavestorms are the most accessible, affordable and popular foam surfboard in the United States bar none! South Bay Board Company is completely unreserved in their passion for water sports and love to see more and more new people trying the sport of surfing every year. Softech have been in the game for a minute! Veterans of the foam board world, Softech has a range of styles that offer a positive surf experience for beginners all the way to the most experienced of riders. “Like the pen company?” Yup! That’s the one. The Bich family established BIC Sport in 1979 and used it to fund, create, and enable their passion projects. Water sports of all kind were at the top that list, and as a result, the pen company actually cranks out some pretty high quality foam surfboards. ​Storm Blade combines years of experience and quality materials to bring you the best in Surfboard equipment. Located in Southern California, their time and passion in the water shows in their products! What Is A Foam Surfboard? A foam surfboard is a surfboard designed with a foam deck as opposed to fiberglass. Are Foam Surfboards Good For Beginners? Foam Boards are ideal for beginners! 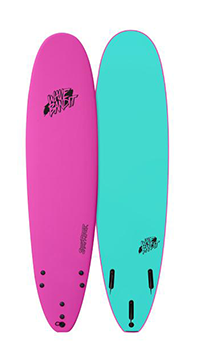 They are more durable, stable, and overall easier to catch and ride waves with than a fiberglass board! Should I Get A Foam Surfboard Or a Regular Longboard? This solely depends on what your intentions are with surfing. If you’re unsure about whether it’s something you really want to do, if you don’t have regular access to a beach, or if you just want to surf for fun, a foam board is a better place to start than a regular longboard. Do You Have To Wax A Foam Surfboard? Some boards are specifically designed with decks that do not require any wax at all. Most foam boards will also provide enough grip sp that you don’t have to apply any wax, but it would benefit you if you did. Finally, some decks will require wax without exception. Read up about the materials and texture of the deck of the board you’re going to purchase first and purchase a bar of base wax and surf wax regardless. Every surfer needs to have wax on deck. How To Wax A Foam Surfboard? How Do You Take Care of a Foam Surfboard? Water absorption and Sunlight and Heat Exposure are the biggest threats to a Foam board’s longevity. The industry standard for foam core is becoming closed cell EPS , which prevents from any serious water damage in the short run. Simply put if you ding your board and you know water has gotten in, you need to find a dry warm area the board can completely dry out over time. Then you will need to repair the board, usually using Epoxy resin. Heat on the other hand is even more simple. The temperature of your board has to stay under 150 degrees Fahrenheit. Avoid contact with direct sunlight using a silver reflective board bag or keeping in the shade. Board socks will cause the board to cook faster when left in the sun and should be avoided entirely. ​Local Surf Shops, Amazon, and of course, Costco! The history and rise of the foamie is really interesting, for a full in-depth insight of the history see our page here. Stick with the classic and grab yourself a Wavestorm! 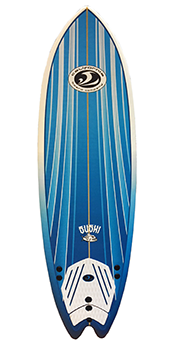 The Wavestorm is the perfect size for beginners looking to paddle out and start catching waves! 8’ x 22 1/2 x 3 1/4 and 11.5 lbs makes this soft top easy to transport, wide and thick enough to provide an optimal level of stability, long enough to paddle with speed, and an overall balance to provide a fair level of maneuverability. Wavestorm have been in this game for a long time and they know exactly which materials to construct their board with. A high quality EPS core, a crosslink water barrier skin top deck, and an HDPE slick bottom all come together to create the ideal foam board! A tri fin set - up with fins, a leash, and traction pad provided all ensure you’ll be able to paddle out and get the most out of your performance with Wavestorm. Overall, Wavestorm established itself as the #1 name in Foam Surfboards years ago and they refuse to be taken down. They continue to produce well balanced boards with the highest quality materials. They make sure these boards are providing the pinnacle foam board experience in order to secure and continue to back their own reputation. It’s for these reasons we recommend not over thinking your purchase and grabbing a Wavestorm today!